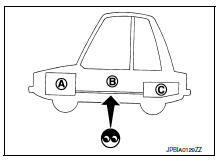 Perform this step when engine is stopped. 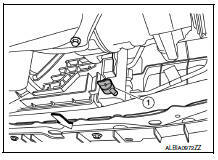 Check that the indicator of drive belt auto-tensioner is within the possible use range. 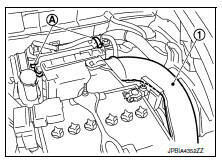 Check the drive belt auto-tensioner indication when the engine is cold. 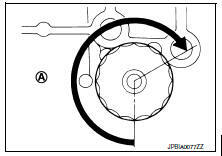 When new drive belt is installed, the indicator should be within the new drive belt range. Visually check entire drive belt for wear, damage or cracks. If the indicator is out of the possible use range or belt is damaged, replace drive belt. Belt tension is not necessary, as it is automatically adjusted by drive belt auto-tensioner. Refer to ma-11, "fluids and lubricants" (united states and canada). Drain the water from the system. 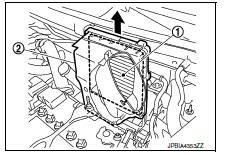 Refer to ma-14, "engine coolant : changing engine coolant". Examine with eyes that there is no stain, clogging, or damage on air cleaner element. Remove dusts (such as dead leafs) on air cleaner element surface and inside cleaner case. If clogging or damage is observed, replace the air cleaner element. Before starting engine, put vehicle horizontally and check the engine oil level. If engine is already started, stop it and allow 10 minutes before checking. Pull out oil level gauge and wipe it clean. Insert oil level gauge and check that the engine oil level is within the range (A) shown. If engine oil is out of range, adjust it. Be careful not to get burned, as engine oil may be hot. Warm up the engine, and check for engine oil leaks from engine components. Refer to MA-17, "ENGINE OIL : Inspection". Remove drain plug and then drain engine oil. Install drain plug with new drain plug washer. Refer to EM-33, "Exploded View". Be sure to clean drain plug and install with new drain plug washer. Tightening torque : 34.3 NВ·m (3.5 kg-m, 25 ft-lb). Refill with new engine oil. Engine oil specification and viscosity: Refer to MA-11, "Engine Oil Recommendation". Engine oil capacity : Refer to LU-17, "Oil Capacity". The refill capacity depends on the engine oil temperature and drain time. Use these specifications for reference only. Always use oil level gauge to determine the proper amount of engine oil in the engine. 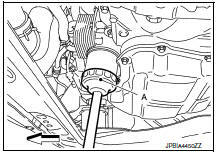 Warm up engine and check area around drain plug and oil filter for engine oil leaks. Stop engine and wait for 10 minutes. Check the engine oil level. Refer to MA-17, "ENGINE OIL : Inspection". Drain engine oil. Refer to MA-18, "ENGINE OIL : Draining". 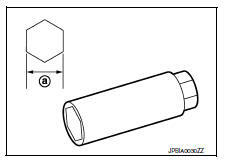 Remove the oil filter using Tool (A) as shown. Be careful not to burn yourself, as the engine oil may be hot. When removing, prepare a shop cloth to absorb any oil leaks or spills. Do not allow engine oil to adhere to the drive belts. Completely wipe off any oil that adheres to the engine and the vehicle. The oil filter is provided with a relief valve. Use a Genuine NISSAN oil filter or equivalent. Remove foreign materials adhering to the oil filter installation surface. Screw oil filter manually until it touches the installation surface, then tighten it by 2/3 turn (A), or tighten to specification. Refill engine with new engine oil. Refer to MA-18, "ENGINE OIL : Refilling". Install engine under cover. Refer to EXT-16, "Exploded View". Check the engine oil level, and adjust the level. Refer to MA-17, "ENGINE OIL : Inspection". Remove ignition coil. Refer to EM-46, "Exploded View". Remove spark plug using suitable tool. Do not drop or shock spark plug. 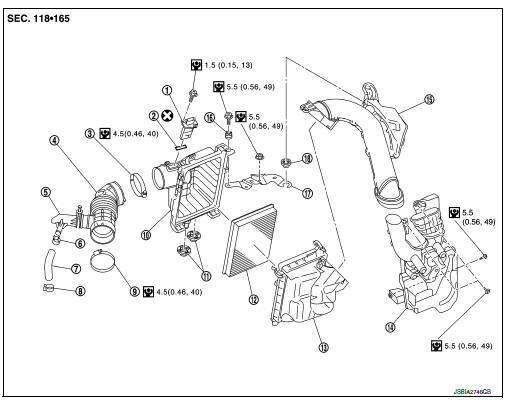 *: Always check with the Parts Department for the latest parts information. 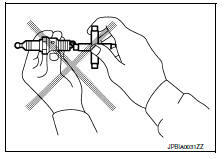 Always tighten the spark plug to specified torque to align the orientation of electrodes. The ground electrode of a genuine spark plug is positioned in the area of maximum ignitability by tightening to the specified torque. When replacing spark plugs, use genuine spark plugs of which the ground electrode is adjusted. The ground electrode of the spark plug is positioned in the area of maximum ignitability to improve combustion efficiency in the cylinder, reduce CO2 (carbon dioxide) emission and improve fuel economy. Use the standard type spark plug for normal condition. Spark plug (Standard type) : Refer to EM-118, "Spark Plug". If plug tip is covered with carbon, spark plug cleaner may be used. Spark plug gap adjustment is not required between replacement intervals. Measure spark plug gap. when it exceeds the limit, replace spark plug even if it is with in the specified replacement mileage. Refer to EM-118, "Spark Plug". Visually inspect EVAP vapor lines for improper attachment and for cracks, damage, loose connections, chafing and deterioration. Inspect fuel tank filler cap vacuum relief valve for clogging, sticking, etc.